Continuing our Mahogany species review, we stay on the African continent and look at Sapele and Utile (also called Sipo). Also in the Meliceae botanical family, these are close cousins of one another from the same genus, Entandrophragma, and it is often difficult to tell them apart. 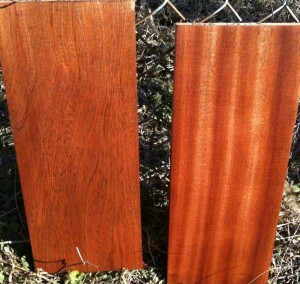 Sapele is at the top of the African market and highly prized as an attractive, stable, and top rated exterior species. 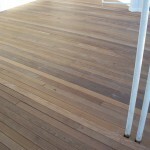 It is especially well known for perfectly parallel ribbon stripe pattern in the quartersawn form and as such it is very often used for veneer in plywood. Utile shares all the same things but slightly more subdued. In flatsawn form, Utile displays a larger pore structure with dark, almost black lines between growth rings. Both species are excellent exterior woods and commercially are used heavily for exterior trim, windows, and doors. As mentioned above both species are often used for plywood veneer though if Utile is used it is probably because it was mistaken for Sapele. Quartersawn Utile have wider ribbon stripes that aren’t quite so parallel. These woods comes from Cameroon, Ghana, The Ivory Coast, and the Congo primarily. The range is much wider as both trees are very hearty. The above areas have the best infrastructure to harvest, saw, and dry for shipment and so are the primary sources. 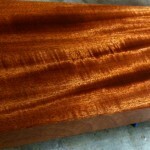 Sapele and Utile are both large trees with a very large and straight bole (central trunk of a tree). They grow in canopy forest so the trees reach for the sun first resulting in very few low hanging branches that create irregular grain and knots. Additionally the sapwood layer is very thin so while creamy white and in stark contrast to the deep red brown heartwood, there is very little of it. The grain is interlocked and spirals around the tree much like the double helix of DNA. It creates very interesting grain patterns but can be difficult to plane without tear out though both Sapele and Utile are much less prone to tearing than African Mahogany. Sapele is slightly harder than Hard Maple with a Janka rating of over 1500 while Utile is just over 1200 making it not quite so hard on edge tools. Despite the interlocking grain, both species are a joy to work with and their beauty speaks for itself. The result of these characteristics is lumber that has great, deep red color consistency, very straight grain with stunning figure in the quartersawn cuts. The boards are readily available in thick cuts of 8/4, 10/4, and 12/4. In fact most African mills do not like to cut 4/4. Additionally wide widths and very long boards are easy to get. Most African mills actually rip the boards down to common 6-8″ widths to match North American FAS grading which is a shame and more often we see importers requesting that this does not happen. Therefore the 12-15″ range is much more common now. Sapele and Utile are both about the same price now and while cheaper than Genuine Mahogany, they are creeping up on it quickly. In my experience as a furniture maker, Utile may actually be superior to Genuine Mahogany in workability, durability, and appearance. The dark grain lines add a great deal of character to the flat sawn face. There are rumors that much of the 18th century “golden age” furniture was actually build from Utile. The exploration and trade in Africa was well underway by the time Europeans had discovered the new world of North and South America so it seems plausible that Utile was in widespread use. Unfortunately no matter how hard I search I can’t find anything to back this up. 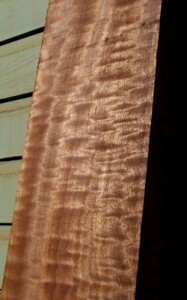 The major difference in Sapele is that often it displays great curly figure or Pommele appearance. It is possible Utile does the same thing but it must be much more rare as I have yet to see an example. Pommele figure is almost like curly or quilted Maple crossed with birds eye that didn’t quite form. It is wild grain that is astonishing when finished. 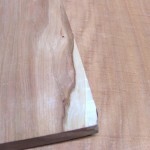 These boards are almost never sawn into smaller widths and lengths as the value is well known. 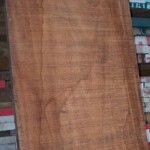 Large slabs are commonly found with Pommele Sapele and the price tag easily exceeds $50 a board foot because these boards are unique in every way. Despite this value, it is still possible that figured boards get missed at the African mills and they get sawn into more traditional boards. Hardwood to Go aggressively seeks out these boards from wholesalers as they usually can’t use them for the door and window manufacturers who want uniform grain pattern. 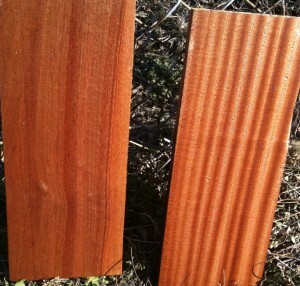 This is why you see a lot of medium to high figured Sapele boards in our stock. It is possible to find Utile in our online store, but it has become so popular and is often sold the moment it comes in to special requests. If Utile interests you then send me an email and put in a custom request. I’ll quote you and send you a message when we have the material in stock. 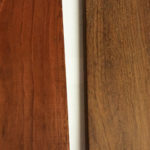 Both of these species are excellent Genuine Mahogany alternatives and you may find that these African cousins could replace Genuine Mahogany in your shop. 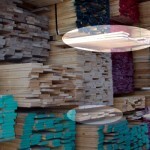 Step up to our virtual lumber racks and pick each and every board for your next project. Add each to your cart and have it shipped right to your doorstep anywhere in North America.Looking for Ipe decking or Teak lumber? Visit our subsidiaries Ipe to Go and Teak to Go. 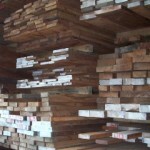 We buy overstock lumber from wholesalers and make it available online to individual woodworkers. We ship nationwide. Submit our online contact form for a Quote.